Rory McIlroy’s win yesterday at the United States Open, at Congressional CC outside Washington, D.C., capped a perfect week of feel-good stories in sports – something we surely do not see enough of. I know I don’t. A fresh-faced, twenty-two year old kid, McIlroy smiled and giggled his way to a record-setting win in the USGA’s toughest test. And it was great to watch. Let’s just hope it doesn’t happen too often. The week started with the Dallas Mavericks upset (?) win over the despised Miami Heat in the NBA Finals. What’s not to like about Dirk Nowitzki? He endured a Finals’ loss in 2006 to the Heat (minus Chris Bosh and LeBron James) and, for the past five years, has been trying to earn that ring for himself, his teammates and Mavs’ owner Mark Cuban. When Nowitzki could have wilted, with the series in Dallas for pivotal Game Five, he stepped up. Big Dirk scored 29 that night then, back in Florida, he pumped in 21, pulled down 11 boards and won the Bill Russell NBA Finals MVP Award. 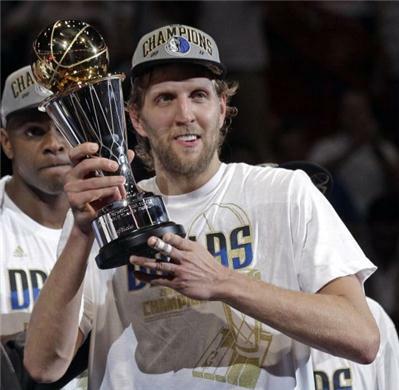 The Mavericks first-ever NBA Championship was as feel-good as basketball gets. Three nights later, with the widest grin I have ever seen, Boston Bruins’ netminder Tim Thomas hoisted his first (and possibly only) Stanley Cup. This guy’s no kid. He’s 37 years old. But he played like he was fifteen years younger than that. Nadia Comaneci didn’t have the flexibility that Thomas did. But what I love most about Tim Thomas is his professionalism. He never gets too high. He never, ever gets too low. And when his counterpart decided to comment on Thomas’ ability and style, Tim Thomas just split a grin through his red beard. Clearly, he knew the fate that Roberto “But I’m great in the regular season” Luongo was about to suffer. Thomas success was as feel-good as the Stanley Cup Playoffs get. And how about Rory McIlroy? The kid just ate the USGA for lunch. The United States Open is supposed to be golf’s toughest test. Maybe it is…but not this year. McIlroy’s win was basically a carbon copy of Tiger Woods’ walk-over in the 2000 Open at Pebble Beach. When Woods won that event, it was his third career major (1997 Masters, 1999 PGA at Medinah). He was 24 years old. McIlroy’s first major championship will never, ever be forgotten, if only because he was the first US Open competitor to ever reach 16-under par. It was a win for the ages, and as feel-good as major championship golf ever gets. There’s only one thing that concerns me. I remember well when Tiger burst onto the scene about fifteen years ago. Everyone loved him and the way he clobbered the rest of the field. Then, as only the sports media can, he started being criticized for the way he pushed his opponents aside like feathers. Fans complained that Tiger’s walk-over wins were getting boring. I hope that doesn’t happen with McIlroy but, if he keeps winning like he did yesterday in Bethesda, it will. But, for this week, I have a grin as big as Tim Thomas’ just thinking about him, Dirk Nowitzki and Rory McIlroy…and what they did for the sporting world. 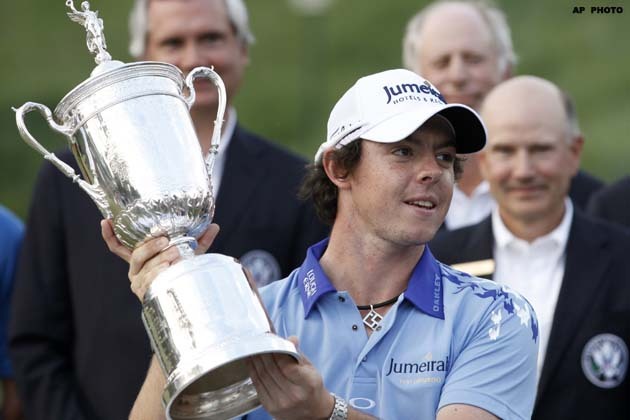 Good luck to Northern Ireland’s twenty-two-year-old Rory McIlroy on winning the US Open. It’s ‘life-changing’ he says. Well, I think we’d all agree with you there, young Rory, and perhaps later on in life as well as being good at golf perhaps you’ll grow a talent for not saying the bleedin’ obvious! LOL!